The unearthing of a fossil in China has shed light on the evolution of the three-part jaw, revealing a previously unknown stage of jaw evolution in an extinct class of armored, prehistoric fish known as placoderms. Placoderms dominated the oceans for many millions of years, and the emergence of jaws in these creatures marks a significant turning point in early vertebrate evolution. While all modern vertebrates have a jaw that is composed of three parts, the jaw system of placoderms was different, with most species having bony plates rather than a full jaw. Several years ago, Min Zhu and colleagues unveiled a fossil, Entelognathus, that had a placoderm-like body but a three-part jaw. However, there was some uncertainty as to whether it could, indeed, be classified as a placoderm. Now, the same group of researchers has unearthed a new species, named Qilinyu, from a fossil bed in China. The preserved part of the fossil is 126 millimeters in length, with an estimated total body length of more than 20 centimeters. Sporting a dolphin-shaped head, this fish appears to have dwelled and fed along the bottom of bodies of water. A comparison of Qilinyu to 372 other species in 104 taxa consistently placed it as a sister group of Entelognathus. 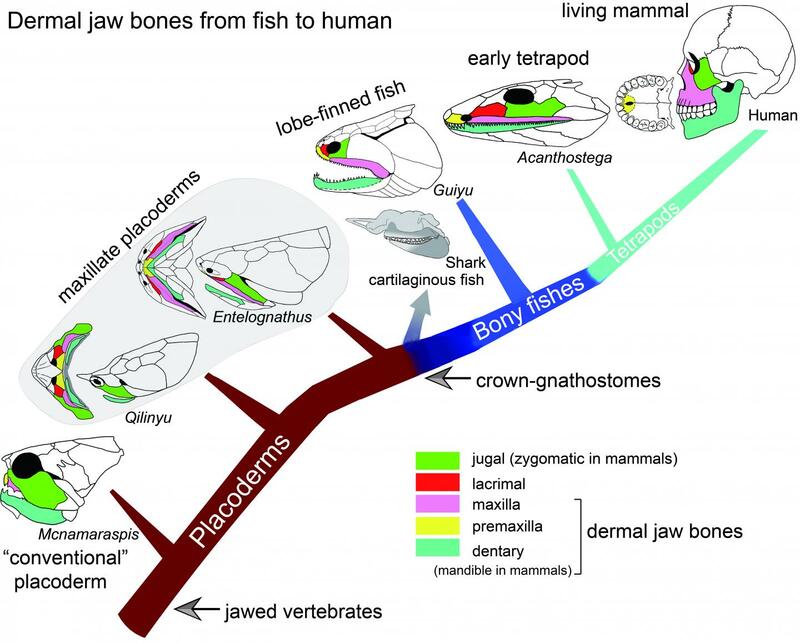 What's more, its jaw reveals the basis of a three-part complex, confirming that such a setup evolved from within the placoderm system, and did not arise independently of the placoderms. A Perspective by John Long discusses this finding in greater detail.